A special edition from BTN editor-in-chief Malcolm Ginsberg, dedicated to Cunard’s Queen Victoria. As reported in ON TOUR, round the world cruises are nothing new. There is a small market for clients who have no wish to spend the dark months in the UK and find that a waterborne world tour is a great way of escaping home chores, knowing that the room will be cleaned at least once daily, with all meals dealt with, and a doctor on call 24 hours. A laundry service is provided, at a cost, and every accommodation deck has a laundrette. Victoria attracted around 200 people, not all from Britain, on the 2016 Cunard complete world circumnavigation cruise. Divided into sectors, she sailed virtually full from every port on the journey, clever world-wide marketing ensuring that all 1,016 staterooms were in use on each leg. Typically, at Hong Kong 1,400 got off, mostly Australians, and 1,400 got on. At Cape Town, for the run back to Southampton, it again balanced out. Some people literally ship-hopped, taking one of the other Queens to Sydney or Hong Kong, and then changing on to Victoria. There were just over 1,000 crew, a two-to-one ratio. Nothing seemed too much for them. Always a ‘good morning’, whether it be the Commodore, or the most lowly seaman repainting some part of the ship. Ocean liner or cruise ship? How do you describe Queen Victoria? In truth, there is no argument. It is a cruise ship disguised as a magnificent 21st-century art deco ocean liner. She is extremely manoeuvrable due to her hybrid propulsion system, which includes bow thrusters and a pair of AZipods at the stern. Victoria can access ports never considered possible by her distinguished predecessors. To put the record straight, Cunard is British, based at Southampton, a sister company to P&O, and part of the US Carnival Corporation. After 176 years of successful operations, it certainly knows how to operate ships but uses the support that the world’s largest cruise company can offer including land-based training and perpetual re-training. Queen Mary 2 (150,000 tons and 2,600 passengers) joined the fleet in 2004, Victoria (90,000 tons) in 2007, and sister ship Queen Elizabeth in 2010. It is very nice to be pampered on Britain’s third largest (floating) luxury hotel after the other two Cunarders. Victoria is a very quiet and regal ship, with only the midday announcements and no karaoke. The Golden Lion pub proved popular for quiz games and bingo, with TVs to keep up with the march of Leicester City. Children are welcome but the numbers will never be that high. Passengers are kept informed with a comprehensive Daily Programme and also ‘Discover’, which makes up for the lack of announcements with numerous offerings, from discounts from the shops in the Royal Arcade and tax-free offerings, drink of the day, casino news and spa promotions. BBC World and Sky International plus many other channels are available on your cabin TV, and the library offers a daily UK news-sheet. One strange thing about the ship. Over dinner, in the lounges, and sitting poolsid,e people do not compare Cunard with other cruise lines (it’s the norm on most). The majority are Cunard regulars from all over the world and are very happy with what some might call ‘old-fashioned’ service. A few are nostalgic for the QE2 but she was from another age, no balcony cabins, and an internal layout that was confusing to say the least. Not so Victoria. QV is very easy to get around with perhaps the only criticism a lack of a ship’s layout plan on every floor at the three lift lobbies. Queen Victoria operates a US Dollar domain for any extra spending, which currently works very much in the favour of the British except for the 15% American-style service charges for your bar items. There are plugs for most electrical appliances, including British three-pin. I suppose even if on a world cruise it is possible to survive very happily without spending an extra cent (that is except for the service charge clearly marked in the brochure). There is an extensive 24-hour courtesy room-service menu, tea/coffee/soft drink stations open all the time, and even gratis ice cream whenever the fancy takes you. 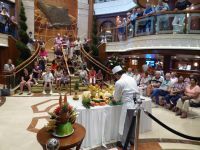 Off-ship, Cunard tours are an extra and more expensive than local offerings. But you are guaranteed Victoria will wait in case of problems (which happened several times on this voyage). At most ports, a complimentary shuttle was provided, usually to the local shopping area but sometimes even to beaches. The alternative is a local taxi or getting together with fellow travellers for a minibus. Some might describe Queen Victoria as a two-class ship but it is hardly noticeable. Grill Class passengers have their own dining room and sun deck, larger staterooms, priority for boarding, disembarkation and tender use when needed, but all mix together in the main passenger areas, and in the swimming pools and Jacuzzis it is impossible to tell anyone apart! Grill passengers can dine lunchtime in the Courtyard, a lovely well-protected area adjoining a private lounge, and take afternoon tea on the sun deck. The rest, poor souls, have to make do with the Queen’s Room, with the famous ‘White Star’ service and quiet live background music provided. 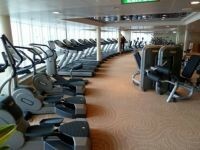 The ship is very well equipped for keep-fit enthusiasts and for those who feel that with all the food being consumed some exercise is required. The sports activity area is high up over the bow above the delightful Commodore Club lounge. A large gymnasium within the Spa complex is very well equipped, with TechnoGym supplying a whole range of the latest equipment. Two decks down from the outdoor sports complex it also overlooks the bow and you can work out while watching a personal TV. It is the same 40 channels available in your cabin. The Royal Spa offers a huge variety of services. Pamper yourself for once! 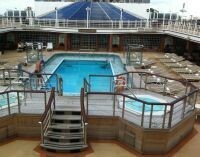 Two sensibly-sized swimming pools are provided and the well-protected Promenade Deck is continuous, with three laps to the mile. Smokers are provided for too in Churchill’s Cigar Lounge and a limited number of designated points but not in cabins or on balconies. However, electronic cigarettes can be used in these private areas. On Queen Victoria, the children’s facilities are divided into the Playzone (2-7) and the Zone (8-17), with both available from 09:00 through to 23:00 with two ‘feeding breaks’ during the day. The very little ones from six months upwards can be looked after in the evening, allowing parents to dine and relax. All part of the package. Next spring, Queen Victoria goes into dry dock at Hamburg for a major mid-life 10-year refurbishment which includes 30 new cabins at the stern making the back-end look similar to the Queen Elizabeth. Ship spotters will be confused. Details are still sparse, Cunard concentrating on the QM2 ‘remastering’ which is about to happen. 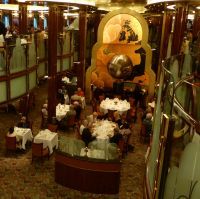 Dining is an important part of any cruise and here Cunard is traditional with 18:30 and 20:30 sittings in the galleried Britannia Restaurant and 18:30 until 21:00 in the Grills. 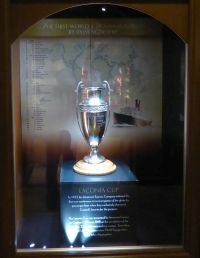 The successful Club Britannia concept (Grills timings and Britannia food) will be added next year during the refit. Jackets are required for dining except in the 24hr Lido Buffet. There are formal nights too. The catering standard is of very high quality, with plenty of choice and special diets taken care of (it helps to pre-advise when you make your booking). The Lido dining area is very well laid out and spacious with every night an alternative (US$15) menu which changes from Prime (meat), Bamboo (Pan Asian), Coriander (Indian) and La Piazza (Italian). The Veranda Restaurant takes its name from a similar offering on the original Queen Elizabeth, the Restaurant of the Stars. A distinctive French carte du jour provides a repertoire in which to indulge. The wines are mostly French too, and at the top end not cheap! It is open for lunch (US$15) and dinner (US$24) with subdued live musical accompaniment provided from the nearby Atrium balcony. Very nice. Cunard’s educational ‘Insight’ series is long-established as a highlight of any cruise, the late David Frost a regular. 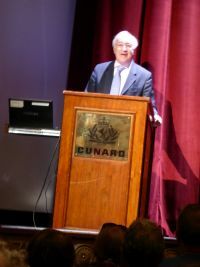 Filling up the Royal Court on this cruise for his two lectures was (Lord) Michael Howard, David Cameron’s predecessor as leader of the Tory Party, an erudite speaker who lectured on Churchill’s coming to power in 1940 and his own life and times in politics. For the third talk he was joined by his wife of more than 40 years, Sandra, once a model and now a successful writer. Sandra was at a very small dinner party at the White House (October 1962 – she was just 21) hosted by Jack Kennedy. He took a few phone calls, but was very relaxed. The Cuban missile crisis broke the next day. Former BBC producer George McGee gave six talks, including on Frank Sinatra and Audrey Hepburn, using the film trailers from some of the great movies of old. And there was much more.The 850-seat Royal Court Theatre would have made the great playhouse designer Frank Matcham feel at home. Designed purely as an entertainment centre, it offers unobscured views from any seat, and even has 16 private boxes. The stage has a lift and every technical aid possible. It doubles as a cinema for wide-screen projection of the latest releases every afternoon. There is a live show nightly, featuring individual cabaret acts and well-known TV celebrities, plus production shows from the in-house team. Our favourite, typically on for just a couple of nights, was a group calling itself ‘The Rewind Project’, four very experienced musicians, ex-Moody Blues, The Hollies and a Cliff Richard Tour. Exceptional, the performance treated as a sort of ‘busman’s holiday’. When the ship leaves late from a port, traditional local entertainment is often provided. For those who want a quiet life, there are plenty of nooks and crannies to relax, but if your idea of a holiday cruise is action, Queen Victoria has a lot to offer. Trivia quizzes are all the rage, there are port lectures to attend, introductory computer lessons, watercolour art, needlework and dance classes hosted by top-notch professional couples. Music is provided to suit all tastes in the many lounges until late. For those interested in the nostalgia of the sea, large-scale models of all three Queens are to be seen, as well as memorabilia from the 176 years of Cunard. The stairwells provide an effective display opportunity for the stars of yesteryear to be remembered traversing the Atlantic on the original Queen Mary and Queen Elizabeth, before the jet age arrived. 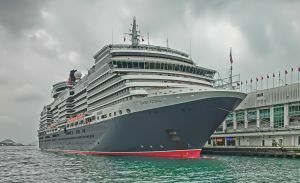 For the summer of 2016, Queen Victoria will again be based at Southampton generally offering a series of seven- and 14-day cruises into the Mediterranean. Try the short break. If you think something more ambitious is for you, future cruises booked on board include a discount.